November's coming to a close which means it is November Favourites time. There's been so many standout books and beauty products this month so I really struggled to condense my loves down for once. No doubt the things that aren't featured here will make an appearance somewhere else in the next month or so. Today we have a bit of everything really; beauty, books and a musical that does not disappoint in the slightest. Enjoy and be sure to let me know what you have loved this month in the comments. Pretty Iconic by Sali Hughes-There is nobody who can make beauty products sound quite as magical as Sali Hughes does. She makes it an art, that is for sure. Pretty Iconic looks at 200 beauty products from the last year and answers why they're staples and have changed the beauty game now or in the past. Many of them have Sali's own personal anecdotes and associations alongside them as well. It's really a book for total beauty obsessives and is the tome you will want to immerse yourself in for a lengthy period of time. I love it and am still reading it as I write this, to savour the decadent prose for a bit longer. MAC Liptensity lipstick in Doe-Given I own a fair amount of lipsticks, it really says something when I reach for the same lipstick over and over rather than rotating them around. That is exactly what happened with me this month and Doe is virtually all I wore. The Liptensity lipsticks sit somewhere between a Cremesheen and a Lustre lipstick from MAC in my opinion. They have an almost slightly tacky feel to them which helps them stick around. Doe is your standard, neutral lipstick but there's just something about it that I find so flattering when I'm wearing it. I love it. Estee Lauder Brow Duo, Brow Now Volumizing Brow Tint* and The Brow Multi Tasker*-I don't usually get too excited by brow products, mainly because I struggle to find ones that don't make my eyebrows look like Helga's from Hey Arnold but these two are the best. I could probably opt to not use the brow gel but it keeps them in place all day so I like to use it. The real winner though is The Brow Multi Tasker pencil, an angled crayon with a spoolie on the other end. I find angular pencils like this a lot easier to use and they can be more forgiving than something like the pomades that are everywhere. Hourglass Ambient Lighting Edit in Surreal Light, limited edition-This palette is inevitably going to end up in a few monthly favourites posts, that's my prediction at least. Just look at its outside casing for starters. Beautiful. Inside you have a finishing powder, two blushers, a strobe powder and a bronzer. One thing I will say is the bronzer is incredibly light so unless you're extremely pale I don't think it will translate as a bronzer. For that reason I use it as a blush. Otherwise I have no real qualms with this palette, aside from its somewhat eye-watering price tag. In saying that, Hourglass palettes last a lifetime so you get your money's worth. The Body Shop Eye Colour Stick in Nevada Gold*-Eyeshadow crayons are one of my many beauty vices. They don't require a great deal of work and are so easy to just swipe on and be done with. I'll admit The Body Shop's aren't quite as creamy as the uber luxe By Terry offerings but they're still pretty fantastic. Nevada Gold is a champagne, sparkly wash of colour for the lids. It's a beautiful colour to wear and lasts really well with primer underneath. It's going to be my go-to in the hotter months. 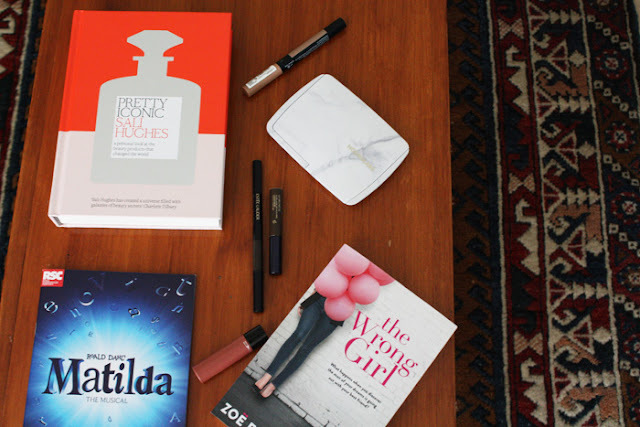 The Wrong Girl by Zoe Foster Blake-While I was in Australia, I went to Readings, which is like a Melbourne version of Unity Books and I purchased Zoe's book alongside one by Frankie magazine. It's the book that has also inspired a TV series on Channel Ten in Australia, which I watched some of and loved. Anyway, I really enjoyed this book. It was the perfect tonic to the mess that was the Presidential Election. It's entertaining, heartwarming and the book equivalent of a bunch of peonies. If you want a light read for the beach this Summer, this is your book. Matilda The Musical-Matilda by Roald Dahl is one of the first books I remember reading by myself and the movie was one I watched countless times in my childhood. Naturally the musical was always, always going to appeal to me. I can tell you it is amazing. Part musical, part play, it is a visual feast and the score is superb. The Australian cast were all so talented too, major props to Elise McCann as Miss Honey and James Millar as Miss Trunchbull. If you get the opportunity to see this show, do not pass it up. -What have you loved during November?